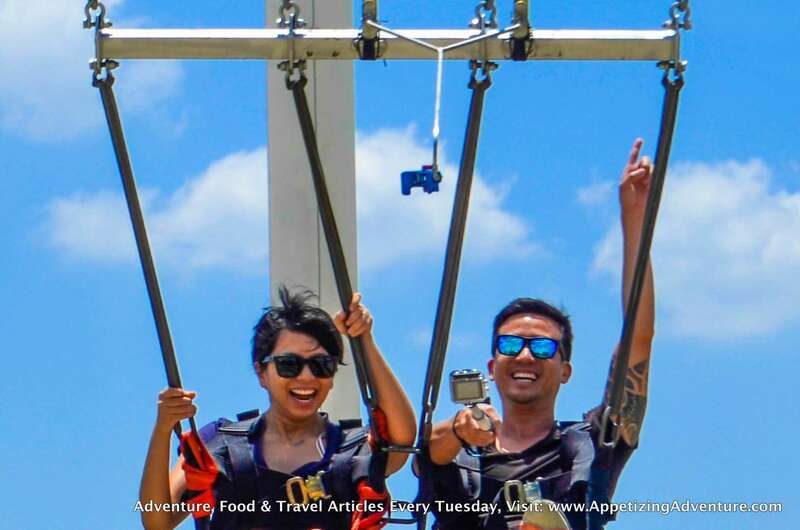 Swinging just took on a different level that will make you scream! 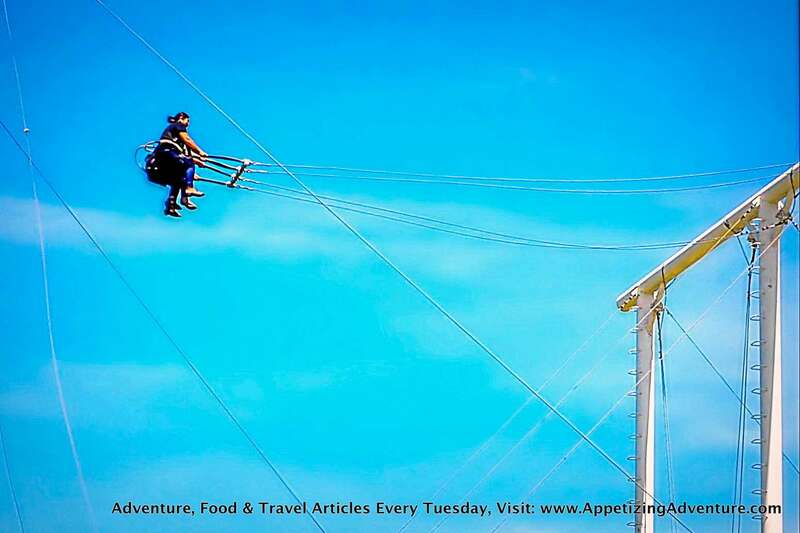 The Giant Swing at the Sandbox Adventure Park in Porac Town of Pampanga Province, is the tallest swing I’ve experienced. I’ve tried it at least five times and the adrenaline rush keeps me coming back for more. 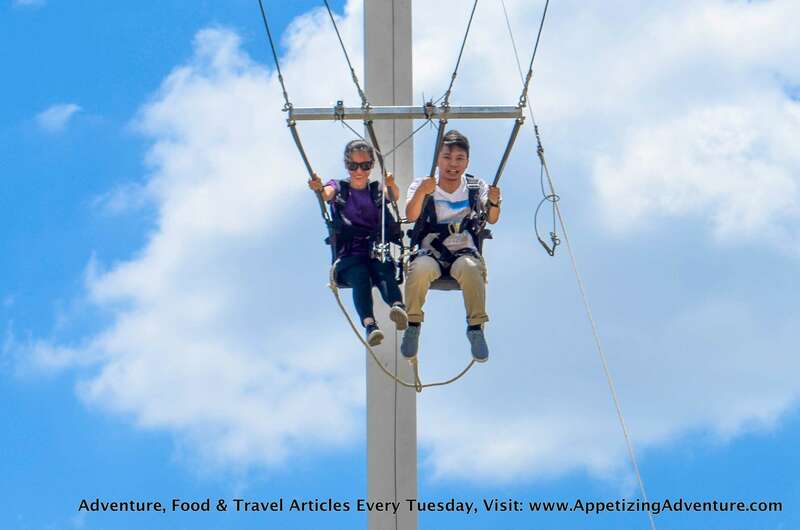 Maybe you’d like to go up 30 feet high, or more, and swing like you’ve never swung before. Swinging at any playground would most often involve one to sit, hold the ropes on the sides, step back a bit or maybe give it a jump, and swing. This time, I sat on the swing and the facilitators strapped me well to the seat. I felt secure. The straps were tight enough to make sure I wouldn’t fall off. And then, I felt my seat being pulled up, backwards. The facilitators started to shrink as I was going higher, and higher. The slow ascent made me feel like I was becoming a giant. I saw the people around me looking up at me, and then I realized I was 30 feet above the ground and my heart started pounding. Before I could process that, it’s as if something suddenly broke free, and I started falling fast! I could almost swear my heart was left somewhere up there as I swung down. I gave out a loud scream. That helped ease the terror of falling. I swung up, and swung down. As the swinging slowed, I was already relaxed, enjoying the wind kissing my face. The second time I tried this was so much easier. I was very confident. I was so brave despite my fear of heights. When I reached 30 feet and started the free fall, it was easy as pie. That’s when I had an agreement with the facilitators to change things a bit for my next tries. The facilitators assessed that it was okay for me to go for the 45 to 50 feet maximum height of the swing. I was excited. But then, as I was pulled up, way higher than I experienced earlier, I had second thoughts. But it was too late. There was no backing out. While I was slowly pulled up, my palms were drenched with scared sweat anticipating the fall. Click! And there it goes. I was falling so fast from way up high and all I could do was scream. The rush was priceless! I had to do it again, and I did. I was so confident that this time, it was going to be a breeze. I mean, I’ve done the 45 to 50 feet height and doing this again seemed child’s play. I thought wrong. The terror was still there! I loved it. 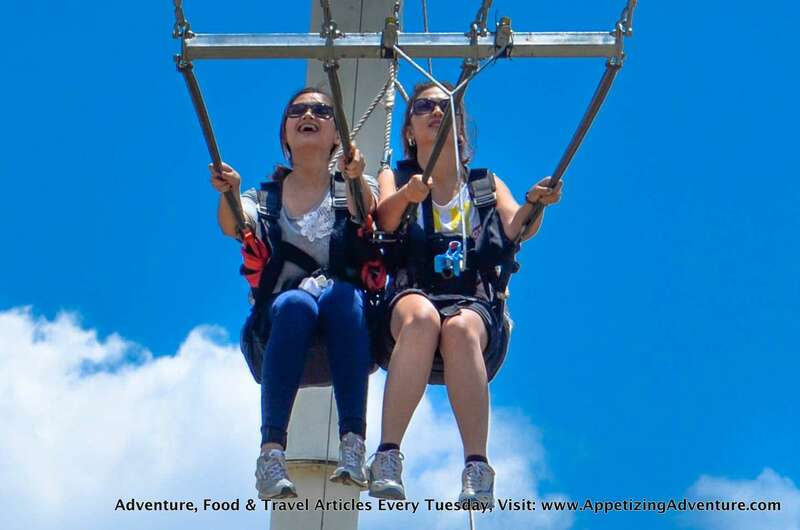 I don’t think I’d ever get tired of doing the Giant Swing over and over again. There are two giant swings at the Sandbox that can accommodate four guests simultaneously, two per swing. A guest may also choose to go solo, but it’s more fun if you have a partner so your voices can blend in harmony while you scream. If you’re wearing a cap, glasses, or if you have things in your pockets you think may fall off, just leave these with the facilitators to be safe. The Giant Swing at the Sandbox, is just that — a swing. A swing is where you sit, and swing. 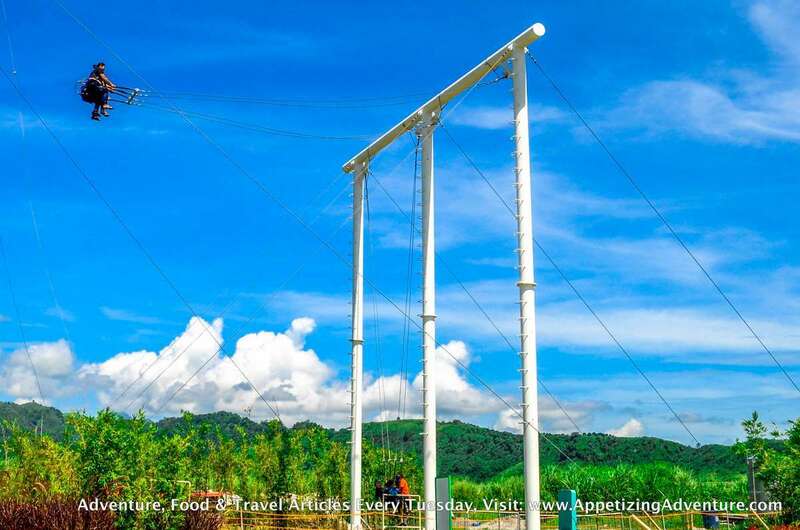 I received a comment that the Dropzone in Dahilayan (Bukidnon) is way higher than the Giant Swing at Sandbox. I’ve tried that too, it is indeed higher, but it’s not called a swing. Nakadapa ang pusisyon dito, hindi nakaupo. 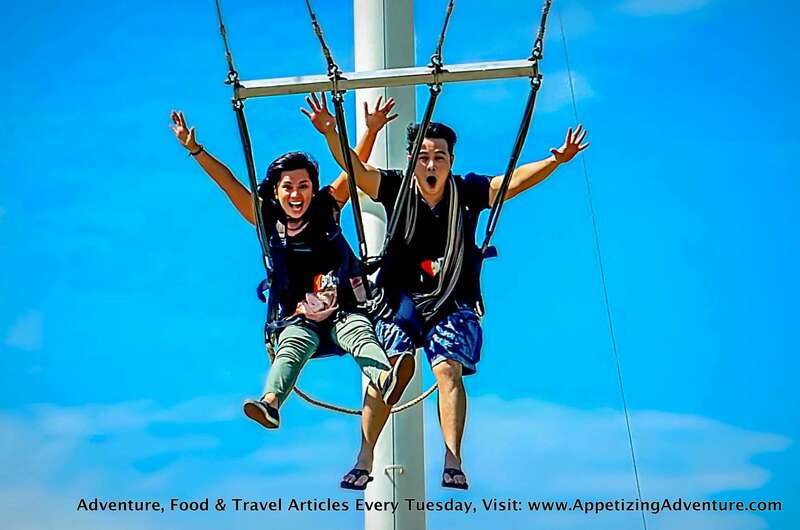 But yes, there’s swinging involved in Dahilayan’s Dropzone.